High Quality of manufacture with 12 months Warranty. Replacement bulbs available (Please seeaccessories below). Click on guidance images for notes on Forgery detection. Click on the Lamp image to return to the normal page. Councils, NHS, government bodies and charitable organisations should contact us to discuss flexible payment terms. 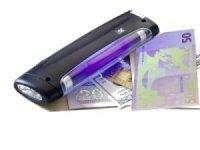 Portable UV torch for use as Money/Credit card/Document Checker. 1 x Single Black UV lamp together with Spot Light. Battery operated with AC Adaptor socket. (Adapter or Batteries not included).